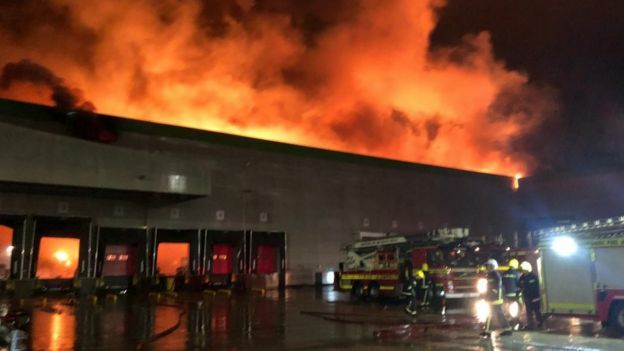 Ocado shares have dropped 6% and the retailer has warned over a hit to sales following a huge fire which swept through its warehouse in Hampshire. About 200 firefighters spent the night tackling the blaze, which broke out on Tuesday morning. The online grocer said it expected a fall in sales growth until it could shift operations to other warehouses. More than 30,000 orders are processed by robots at the Andover warehouse each week. Ocado has not given any detail about what the impact will be to customers. 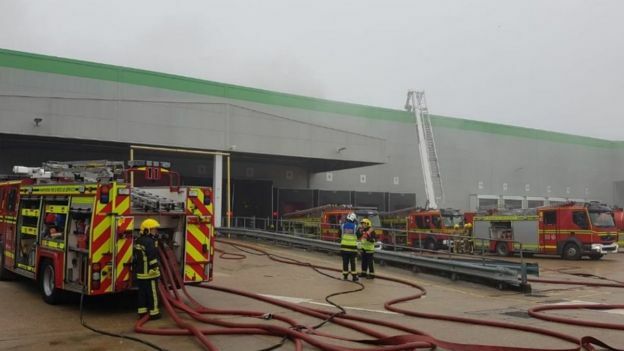 Ocado has other warehouses, including in Hatfield, Hertfordshire, which have been unaffected. The site, on the Walworth Industrial Estate, accounts for 10% of Ocado’s capacity. Ocado said it had comprehensive insurance for the property, stock and equipment and for business interruption losses. “Once we have had time to assess the damage and prepare a plan to return the CFC (customer fulfilment centre) to operation we will update further as appropriate,” a spokesman said. Hampshire Fire and Rescue Service said about 70 firefighters remain at the site and urged nearby residents to keep doors and windows shut. No Ocado staff were injured. 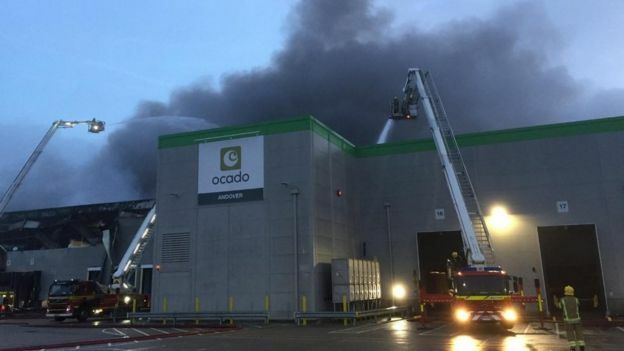 On Tuesday Ocado said it had cancelled some customer orders because of the fire and it was “working hard to resume normal service as soon as possible”. The blaze came on the same day it reported widening losses. The company recorded a pre-tax loss of £44.4m for the year ending 2 December 2018, compared with £9.8m in the previous 12 months.